What are the Best Home Gym Flooring Options? If you want honest home gym reviews, then you’ve come to the right place. I have spent countless hours researching through consumer reports and testing home gym equipment, so that I can provide you with the information on this site. Hopefully it will help you make more informed decisions when it comes to putting together your own home gyms! It’s that time of year again, my turn to outline some of the best home gyms and pieces of home gym equipment that I think are worthy of your custom. These 2018 picks are my opinion, yours maybe entirely different and you’re entitled to your own opinion. However, from my many years experience in the fitness equipment industry I believe these are the very best pieces of home gym equipment in 2018. In the table below I’ve included the very best home gym in each specific category, such as price range, resistance type, and even floor dimensions! If I’ve written a review on the site then I’ll link to that in the table too! If you’re looking for budget home gyms then be sure to take a look at my best rated home gyms for under $1000. When it comes to finding a home gym it’s way more difficult than trying to decide which piece of cardio equipment to buy. In this guide to buying a home gym I’ll help you get to grips with the different types of home gyms, and understand which type of home gym is right for you and your fitness goals. The choice is seemingly never ending. Before you head out on your shopping travels, it’s essential that you have an understanding of what it is you will need from your home gym machine, if you don’t it’s impossible to make an informed decision. The choice between them comes down to what your goals are and of course, the budget you’re working with. Weight plate loaded machines are great for power lifters and those looking to build serious muscle. They don’t have limits in terms of resistance and you can swap and change weight plates on a whim. 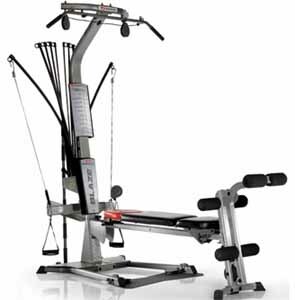 The fixed stack machines like the EXM 1500S are a good choice for those looking to tone up and increase strength, they’re similar in size and function as to commercial gym equipment. The leverage plate loaded machines like those from Powertec are a good option for those wishing to lift heavier weights but want to do so safely without the use of a spotter. Power rods like the ones found on all Bowflex home gyms are the perfect choice for the majority of people. They have a maximum resistance of just over 400lbs and they combine multiple exercises. The Bottom Line – Price! You’ve looked at your goals, you’ve determined what pieces of equipment you’ll need, you’ve even envisioned how they’ll fit in to your home, but as with everything you’re looking to buy, it all boils down to price! You can pick up a quality yet cheap home gym these days for a lot less then you’d pay for a fancy piece of cardio equipment. For a little under $100 you can pick up the Bodylastics Resistance Bands, a perfect choice in addition to any home gym. Depending on your goals they can also provide everything you need from a home gym. If you’re looking into buying a single station machine with a built in weight stack then you can expect to pay around $500-$650 for a quality one. However, any less and you’re probably buying a piece of junk. For an all purpose multi function home gym of real quality then you can expect to pay between $800-$4000. The best home gym for the money in my view is the Bowflex Blaze. Although the gyms aren’t designed for the heavy lifter, it does provide a challenging workout with resistance up to 210 lbs and up to 410 lbs with upgradeable rods. When buying any home gym machine, always look at the length of parts warranty, this generally gives an idea of how well the gym is made. Frame warranty is important too, if you have a home gym that has a frame warranty of just 1 year you can expect it to be pretty poorly built. Vice versa if it comes with a 10 year warranty. Perhaps common sense, but before you go to the store or online to buy, always carry out extensive research. That doesn’t just mean read reviews on the site that sells them, ask around in forums, look for threads on the topic, check on this site, look on Amazon for feedback. Ask people about their experiences with it too and ask how the customer support was if they used it. Just get an expert understanding of everything before you commit to buy, if you don’t you may just regret it.